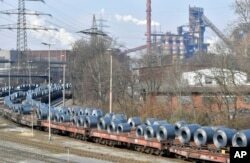 President Donald Trump has approved measures adding 25 percent tariffs on steel entering the United States and 10 percent tariffs on imported aluminum. The new taxes are to go into effect in 15 days. The president signed the measures in a ceremony at the White House on Thursday. Workers employed by U.S. steel and aluminum manufacturers attended the event. The president, however, is permitting exceptions to the tariffs for metal imports from Canada and Mexico. Both countries are currently negotiating with U.S. officials to change the North American Free Trade Agreement (NAFTA). The president spoke at a cabinet meeting Thursday morning. He said U.S. officials “have a right” to drop or add countries to the list of exceptions. Officials said those exemptions would be made on a “case by case” and “country by country” basis. Talk of the tariffs brought warnings of a trade war from Europe and China. One European Union official even said the EU would target goods from areas governed by Trump’s Republican Party. The president has argued that the tariffs would prevent low-cost imports, especially from China, from hurting U.S. industries and jobs. China had a record $375.2 billion goods surplus with the United States last year. A Chinese employee sorts hot red steel at a steel plant in Zouping in China's eastern Shandong province on March 5, 2018. In Brussels, European Commission Vice President Jyrki Katainen said the EU has told the U.S. that tariffs were a bad idea. He said the U.S. lost thousands of jobs when it ordered tariffs on steel imported from Europe in the 2000s. Another official was firm in his response. “If Donald Trump puts in place the measures this evening, we have a whole arsenal at our disposal with which to respond,” said Peter Moscovici of France. He serves as the European Commissioner for Economic and Financial Affairs. The European measures could include tariffs on American oranges, tobacco and bourbon, he said. Some of the goods are produced in parts of the United States where Trump is popular. Trump’s plan to tax steel and aluminum imports has faced growing opposition from congressional Republicans and American businesses. Many were worried about possible effects on the economy. On Tuesday, Gary Cohn, the president’s chief economic advisor, announced that he would leave the White House. Cohn has long argued for free trade and against tariffs. Hai Do wrote this story for VOA Learning English. His report was based on information from the Associated Press and the Reuters news agency. The editor was George Grow.